A special election is being held today (April 28) to fill vacancies for Ward 4 and Ward 8 Council seats. So we took a look at the voting history of special elections in the District, and of all Ward 4 and Ward 8 elections for which we have data. We also looked at the last ten years of District general and primary election history of Ward 4 and Ward 8. (Please note we were unable to get 2004 Presidential Preference Primary data by ward in the time for this post.) The primary election figures show a steady number of registered voters for primary elections, with a slight upward trend. This is true city-wide, as well as in Wards 4 and 8. The actual number of votes cast varies widely, however. The total number of registered voters for the general election has been steady, with a slight upward trend, until the 2014 election, which shows a 4 percent drop in registrants District-wide. 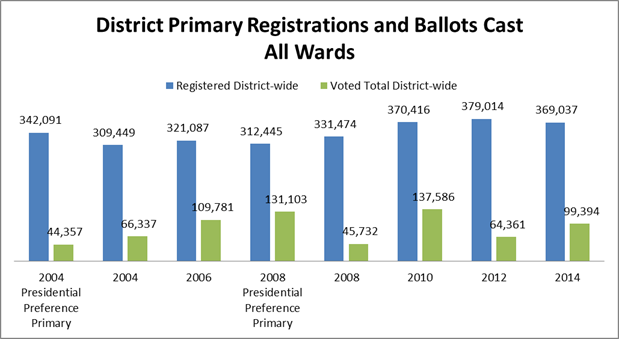 Ward 4 registrants dropped 7 percent between 2012 and 2014, and Ward 8 registrants dropped 11 percent from 2012 to 2014. The number of votes cast is consistently higher in presidential election years. Each election is unique, data points are few, and there have been many changes in elections laws over the years. So, we draw no major conclusions at this time from the data. However, a couple of interesting things stand out. 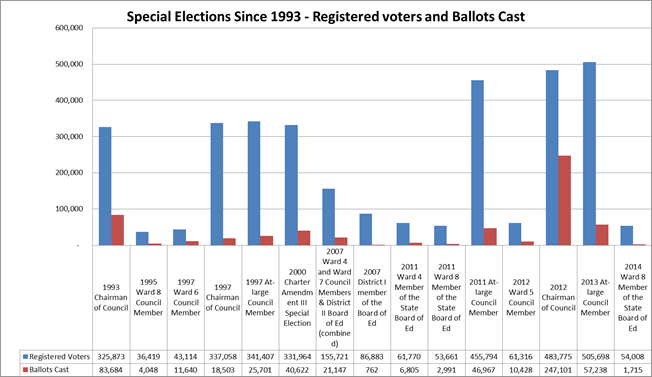 First, there was a large bump in registered voter for special elections between the year 2000 and 2011. It’s possible this reflects the increased population since 2000, but there may be other reasons why the more recent special elections drew more people to register. Second, there does appear to be a slight drop-off in registered voters for primary and general elections between 2012 and 2014. Lastly, the data also follow the well-known, and often reported, trend that general elections draw the most voters, well above the numbers for primary or special elections. What exactly is this data? Data are from the archive of election results reported by the District of Columbia Board of Elections. < Previous Painting and Sculpture for Sale. Asking Price: $300 million. How can a handful of artworks be worth more than all the homes in Georgetown? Thanks for posting this today! It might be helpful to have percentages on the charts.